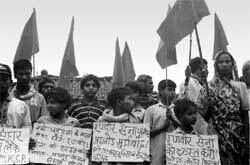 As prime minister A B Vajpayee was reminding the nation about threats from across the border in his Independence Day speech from Delhi's Red Fort this year, a group of extreme Leftist outfits, popularly known as Naxalites, were redrawing the internal map of the country. At a secret meeting held in West Bengal's Siliguri, they declared sovereignty over India's forests. The meeting was significant as it brought the two dominant Naxalite groups -- Maoist Communist Centre (mcc) and the People's War Group (pwg) -- together for the first time to form a death ring in 10 states. A new era of terror was about to be unleashed and India's forests were to become the next battlefield for the war of hegemony. It is showing up: 827 incidents and 423 deaths in the last nine months. In October, a little known Naxalite group abducted a relative of the Union minister of state for home affairs. Factories owned by the Union minister of state for defence and the Andhra Pradesh (ap) chief minister were blasted by pwg. In Orissa, a minister's house was burnt down. Each day in the first week of December saw police and government officials clash with Naxalites in ap, Jharkhand and Orissa. The renewed attacks have prompted the Union government to ban the pwg and the mcc under the recently-promulgated Prevention of Terrorism Ordinance (poto). Naxalites, the extreme leftist movement tracing their origin to a radical peasant uprising against landlords in West Bengal in 1967, today rule India's best forests. Some 40 groups control a region that stretches from the Indo-Nepal border to coastal ap -- an area two-and-half times the size of Bangladesh. And they are spreading faster than forest fires: from a small village to 10 states in just 35 years. Since then, more people have been killed by Naxalites-related violence than in the 10-year-old militancy in Kashmir. Despite the massive police operations, they have continued to spread to new areas. And there is a reason.By ensuring people's access to forest and distributing forestlands for cultivation, Naxalites have established parallel governments. Willingly or hesitantly, the people too have begun to trust them instead of the government -- more for livelihood than for Marx or Mao. The denser the forest, the more is the alienation -- tribal people are refused entry into forests; they cannot cultivate lands they believe is theirs. It is simple. People want livelihood, government wants control over forests and Naxalites want 'revolution' against this. "Naxalites have put their weapons at people's service in face of such dilemma," says K Balgopal, a civil rights activist in Hyderabad who recently wrote a book on the movement. On one side is the elected government, which with its misplaced regulations has never addressed people's needs. On the other, is a band of armed people knocking on people's doors to solve their problems instantly -- at gun point. Caught between the warring groups, the people prefer the latter. "The parallel government is fast, accessible and gives people access to their livelihood sources," admits a senior police official from Chattisgarh who did not want to be named. For example, courts in the Naxalite-affected areas of Jharkhand have witnessed a drop in the number of cases -- from 2,400 in 1996 to 1,600 in 1997. In the Naxalite-infested areas, the government ceases to exist. An oral diktat from a Naxalite leader is enough to make government officials shiver. In ap's Telengana region, more than 50 local elected leaders of the ruling Telengu Desam Party (tdp) had to quit the party due to threats from the pwg during the last five years. And those who refuse to listen are killed. Around 2,077 people have been killed in ap by the pwg in the past decade -- politicians comprise 30 per cent of the victims. Governments too are at the mercy of the Naxalites.In Orissa, the government had to withdraw its police force in Malkangiri district when nine police officials were killed by the pwg in August this year. Ironically, over 60 per cent of the state's forces were deployed in this district alone to fight Naxalites. "It was a humiliating defeat," admits a senior state police officer involved anti-Naxal operations for the past 10 years. In Chattisgarh's Bijapur village, one can't spot a police personnel -- they do not wear uniforms out of fear. "The police never come to our village. 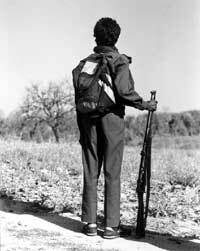 Naxalites solve our problems," says Sukaru Ram, an 18-year-old boy from Pengunda village, some 90 km from Bijapur. Of Jharkhand's 18 districts, 12 are under the control of the mcc and the pwg. On November 2, the mcc gunned down 13 police personnel in Topchanchi block of Dhanbad district. Recent reports in the media suggest that Naxalites are planning to field candidates for the forthcoming panchayat elections. Out of 81 assembly constituencies in the state, the Naxalites could decide the winning candidates in 31 of them. The administration fears a 'total takeover' by the mcc. In Bihar, the mcc and pwg are known to 'tax' even government programmes like Operation Siddharth, Jawahar Rojgar Yojna and Minimum Needs Programme. Government officials siphon off the funds as "protection money". An estimate by the Palamu Commissionary three years ago found mcc and the Party Unity (now merged with the pwg) had collected Rs 30 crore per month as levy. Caught between the government and the Naxalites, the common people are the worst affected. Both doubt them as informers and this often results in blind deaths. For the police such deaths are the regular fake encounters and for the Naxalites 'execution of the people's enemy'. in warangal, Andhra Pradesh, there is only one black Ambassador car in the official circle and it belongs to the conservator of forests. Painting the car black some 15 years ago was a conscious decision to evade attacks. The black Ambassador drives home the fear psychosis that has gripped the forest officials. "There is always a risk of an attack," says P Raghuveer, the conservator of forests. Nearly 10.03 million hectares (mha) of forests in the country are under the control of Naxalites (see map: Rapid red spread). Being primarily a tribal dominated areas, the presence of the armed cadres and the police have affected people's lives. Government officials hardly venture into villages inside the forests. The result: little signs of governance. Exploiting this vacuum, poachers are on a rampage and the timber mafia is eating into the forests. Besides, the Naxalites' campaign to grab forestland and clear them for cultivation has become a new problem for state forest departments. Says a deputy inspector-general of forests in the Union ministry of environment and forests (mef), "The encroachment has become so widespread that we had to shelve a plan to regularise encroachments prior to 1980. If we do so there will be pressures from these groups to regularise all the forests under their control." According to mef data, over 0.4 mha of forests in the country are under encroachment -- 60 per cent of which are in the Naxalite-affected areas. During a case in the Supreme Court regarding encounter killings of Naxalites, even the ap government admitted that around 0.2 mha of forestlands are controlled by the Naxalites. According to the 1999 Forest Survey Report , in almost all the Naxalite-affected districts, forest loss has been attributed to encroachment due to 'local disturbances'. "The forest department is not needed. We will take care to protect the forests," says Dilip, a young member of the mcc speaking to Down To Earth . The forest officials are more than willing. "They tell us not to disturb land use. And we just adhere to that," says a senior forest official in Visakhapatnam district. "Large forest areas remain out of bounds as they virtually control those as liberated zones," says K D R Jayakumar, Visakhapatnam's conservator of forest. Even the pwg in its report titled Political and Organisational Overview prepared after its conclave in February 1995 has admitted that its land grabbing campaigns have contributed to forest loss . "Our nationalised treasury is being emptied," wrote wildlife expert Valmik Thapar in a recent Planning Commission paper. "The mef informed the Planning Commission that an estimated Rs 50,000 crore is being stolen from India's poorly protected forests. The real fear is not from the Naxalites who have agreed for conservation, but from smugglers and poachers who enter these forest exploiting the Naxals presence." The pwg controls the entire Dandakaryanya region comprising Khammam, Nizamabad and Warangal in Andhra Pradesh, Bastar, Dantewada and Rajnandgaon in Chattisgarh, some parts of western Orissa, Gadchiroli and Bhandara of Maharashtra and Balaghat district of Madhya Pradesh. Once believed to be no more than a hideout, the southwest part of Bastar region is now a bastion. Most parts of the Bastar and Sarguja regions are now under the control of the Naxalites. Even forest areas in Jharkhand, especially in the districts of Palamu, Gumla, Latehar, Chatra, Garwa, Lohardaga, Koderma, Hazaribagh, Giridih, Santhal Pargana and Dhanbad are under the grip of the Naxalites. An Intelligence Bureau report has marked some of these districts as 'obliterated'. This has resulted in the loss of revenue for the forest department. Admits a divisional forest officer, "One cannot deny that there is loss of revenue." "The price bidding in Warangal and Adilabad districts is the lowest in the state as very few contractors come forward because they have to not only pay an additional price to the people and also give money to the Naxalites." This is reflected in the forest department's revenue collection. Out of 90 units of beedi leaf collection centres, only 58 could be sold in Warangal district . In Jharkhand's Naxalite-affected districts, revenue from forests has gone down by 60 per cent, according to top forest officials. In Chattisgarh, more than 40 forest employees have been killed in the last seven years. Vajpayee's first tour to Bastar was called off after pwg blasted a police convoy killing 16 policepersons on October 16, 1998. In the Indravati Tiger Reserve, forest officials hardly enter the deep forest. Says superintendent of the reserve, D N Netam, "We cannot go deep inside the forest." As a result, poachers have killed half of the tigers in the reserve in the past six years. For forest officials, there is no estimate as to how many groups of poachers and smugglers are in operation as they are yet to make any serious foray into the forest in the last five years. The last tiger census indicates that while there are some tigers on the southeast bank of the Krishna river, there are virtually none left in the Nallamalla Range. It is said that villagers poisoned tigers at the behest of Naxalites groups. After a sustained battle in the Supreme Court, the mef, in 1997, agreed to give separate security forces for counter insurgency operation in six of the 23 project tiger reserves -- Manas, Palamu, Valmiki, Nagarjunasagar, Indravati and Bandipur. All these reserves are affected by armed struggles. But the move backfired after some organisations operating in these areas protested against such forces alleging harassment of local people. "Only 30 per cent of forest reserves in the country are monitored by forest officials," says a forest department official wishing to remain anonymous. The movement of officials has been restricted to such an extent that no official dares to leave the tarred road. "In the 1980s, they could travel without arms for 10-12 km, but now only 3-5 km is possible," he adds. This has had its impact on the people too. On June 15, some mcc activists burnt a few houses in the village of Pahar Panari in the Gumla district in Jharkhand. But the police could not reach there even by June 20, in spite of a police station located within a radius of 10 km. "Even ministers cannot go into the forest," says Ramesh Sharan, an economist with the Ranchi University. It is alleged that mcc and pwg cadres with support from the Katha mafia are threatening the tiger population. The pwg in north Telengana have killed many tigers between 1990-95 to demonstrate that "wildlife is not as important as people". Slowly, the Naxalites are stepping into the forest department's shoes. There is a growing nexus between them and the timber mafia and traders. The contractors used to earlier bribe the forest department officials for trading in forest produce like timber. Now they pay a levy to the Naxalites. In Jharkhand, police sources say that about Rs 1.20 crore has been deposited by the Naxalites in various banks using fake names. The contractors are happy. Earlier they had to bribe forest officials, police and local criminals. Now they pay only to Naxalites. In ap, a leading paper mill company reportedly pays Rs 50 lakh per month as "protection money" to Naxalite groups. The presence of Naxalites has also discouraged many ngos working with tribal people. The Jharkhand government's World Bank-aided India Eco-Development Project (iedp) to generate employment had to be abandoned. Similarly in ap, two ngos were driven out (see box: Looking back). The Naxalites are against ngos as they tend to 'eat away funds'. Says sociologist Jaya Roy, says, "They don't want ngos to organise people." Although the history of Bastar is punctuated with strong rebellions for land, water and forest rights, the gains have been limited for people. Some experts feel that the support to Naxalites in the rural Bastar may be seen as the extension of the fight for land and forest. "Large tracts are virtually under their control where they run a parallel government," reports a finding of the Delhi-based Institute of Peace and Conflict Studies. The reasons: poor implementation of land reforms, bad governance and ineffective police forces. Naxalite vs state is a contest of claims over natural resources," says Jannardan Rao, a professor at Kakatiya University, Warangal. Take the case of the Nallamalai range in ap's east Goodavari district. The 40,000-strong Chenchu tribes, who neither cultivate nor construct houses, are being evicted from the forests as the government has declared the range a national park. So Nallamalai is now the new battleground for Naxalites and the police. The forest regulations are such that they do not allow developmental work inside forests. This is alienating a large chunk of the tribal population. Naxalites exploit this. In Chattisgarh, people have been demanding renovation of their traditional ponds for the past three decades. "Naxalites construct talabs in forest areas where the government can't even attempt due to the Forest Conservation Act (fca)," says Ramchandra Singh Deo, finance minister, Chattisgarh. 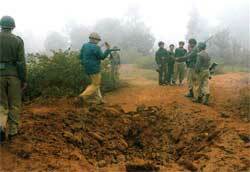 Naxalites have seized the initiative to renovate old ponds in several villages in ap and Chattisgarh. Under the fca, the state government has to secure the permission of the Union government before diverting forestland to non-forest areas. While large projects are passed by the state with mef, permisson for small projects like pond renovation are not taken up. This fuels people's anger. According to a pwg report, in the face of the second consecutive drought, extensive water tanks renovation in forests was taken up. This strategy has swayed people's support towards them.